Crushing Comics S01E046 – November Collected Edition Haul! Kids’ comics, Deadpool & X-Force Omnibus, WildStorm, & more! Today is a true unboxing, as I unpack the contents of my November comics order from the states! The order starts with a big hunk of books to read with my daughter – The Return of Zita The Space Girl, Coady & The Creepies, and Gotham Academy! Then, we get to the superheroes – a Hulk Epic Collection, Fantastic Four Marvel Masterworks, the new Deadpool & X-Force omnibus, and DC’s WildStorm 25 Anniversary hardcover! Do you know what you get coupons for new toothpaste when you move into a new home? It’s not just to welcome you – it’s because moving makes you more apt to change your habits! It’s fitting that after chatting about changed habits that I pulled out one of the handful of comics that brought me back to collecting when I moved into my first house in 2010 – Warren Ellis and John Cassaday’s Planetary! I place all remixed songs into one of two categories: enhancing or reimagining. Some remixes enhance the original. Add more rhythms, speed things up, restructure the song. Other remixes reimagine the original, taking just one or two elements like a vocal or a prominent riff and build a whole new song from scratch – often sans the identifying bass line or chord changes of the original. I’ve liked both kinds of remixes over the years, but sometimes when I hear a reimagination I think, “Why didn’t they just write their own song?” Aside from a copped vocal hook, sometimes they can be an entirely other creature than the original. Why call it “Song X (remix)” rather than “Song Y (featuring samples from Song X)”? It’s all a study in taxonomy, I suppose – calling things by a name that will generate the most interest and success for them. Which brings me to The Wild Storm. 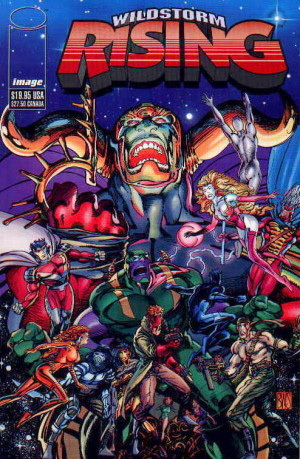 WildStorm was one of the original Image Comics studios and the one with the richest expanded universe of characters. That’s what made it attractive for DC Comics to purchase from original studio head Jim Lee when he wanted to ditch administration to return to illustration, and why the WildStorm characters have continued to appear in DC-published comics for over a decade. 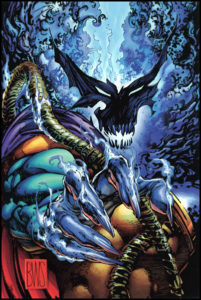 DC has done a lot of different remixes on the WildStorm characters and concepts since they first acquired the publisher in 1999. They’ve published straight-up continuances of the original continuity. They’ve done a trademark soft reset of continuity. They’ve mashed WildStorm into DC’s own history, putting characters like Grifter and Deathblow in league with DC stalwarts like Deathstroke and Amanda Waller. 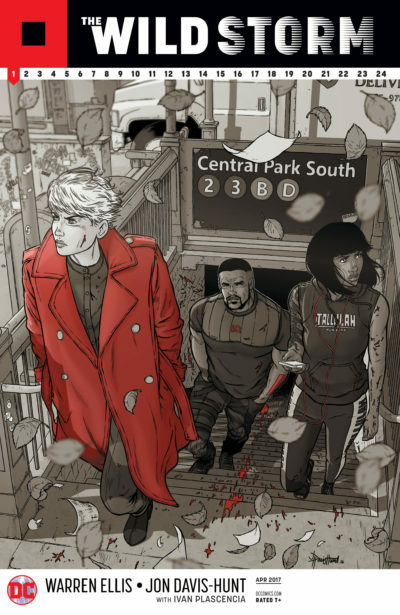 The Wild Storm is something different entirely – a reimagination rather than an enhancement. Warren Ellis, one of the most famous and famously-reliable writers in comics today, has been handed the WildStorm intellectual property as a whole by DC Comics and instructed to create his own reimagination of the original with no strings attached. Is it recognizable as WildStorm? Is it another great Warren Ellis book? Is it any good. The Wild Storm (2017) #1, written by Warren Ellis with artist Jon Davis-Hunt, colorist Ivan Plascenia, and lettered Simon Bowland. This issue will be collected in The Wild Storm, Vol. 1. Warren Ellis has the entire palette of classic WildStorm players to work with to launch his reimagined WildStorm Universe. He selected some of the best characters of the bunch for this first issue, but the story relies on a lot of nostalgic expectations of what WildStorm consists of in order to click. This is not the unrelenting debut issue you’ve come to expect from Ellis after reading books like Injection, Trees, Karnak, Moon Knight, and even as far back as Planetary. Even on the Astonishing X-Men, a run that left fans lukewarm, Ellis’s first issue was a bomb disguised as a puzzle box. [Patreon-Nov16-Post-Bug][/Patreon-Nov16-Post-Bug]It’s the grand finale of my daily read of the first three years of WildStorm Comics – WildStorm Rising! The crossover is really only meaningful to a trio of them – dual flagships WildCATS and Stormwatch, and the debut of Grifter. Everyone else is merely a bystander in the culmination of a year-long plot launched in Stormwatch to alter the struggling status quo in WildCATs. There are pros and cons to any linewide crossover, and WildStorm Rising is no exception. On the pro side, the event manages to accomplish something that few Marvel crossovers could manage back in the 90s (and still can’t today): Each chapter worked well as an issue of its own book advancing some of its own themes. That’s despite the fact that many books weren’t written by their typical authors and many of them continued directly to the next title in the crossover sequence. Plus, we really do get a new status quo for several books, none more so than WildCATs! Even worse, it turns out the McGuffin has no real meaning in a hairpin final turn – it was merely a red herring to bring back a fan favorite character squandered too early in the life of the line! What is this amazing McGuffin? It’s both a key and a symbol. It’s about the balance of power in the ruling class of Daemonites. When they arrived on a space ship chasing the Kherubim, there was a natural division of power between politics, military, and (sort of) transportation. A representative of each held a key to the ship that also signified their unquestionable ruling power. All three would need to align their keys to activate interstellar navigation technology so none could shift the balance of power too far towards government, military might, or (one would imagine) commerce and colonization. The transportation key was lost in the ship’s crash, which left the political and military arms of the Daemonites stuck in a two-party struggle for planetary power for 2,000 years with no means to escape. Now, the two pieces of the lost key have showed up in possession of a rogue Daemonite and a member of Team 7, and both sides of the Daemonites are racing to collect them – while the assembled might of our heroes try to defend them while resolving their inter-squad squabbles. Is WildStorm Rising worth a read? As a self-contained event it’s nothing special. However, if you plan to read any other WildStorm books from 1995-1997 – like Grifter’s solo series or Alan Moore’s WildCats – it’s a good primer. It’s far back enough from Ellis’s takeover on Stormwatch to be relevant there. The rest of this post is split into two sections. The first reviews each issue of the crossover (w/links to purchase) with relatively few comments on plot. The second second offers a plot recap of each issue so you can fill in the gaps of your read. Want to read the entire thing in one go? 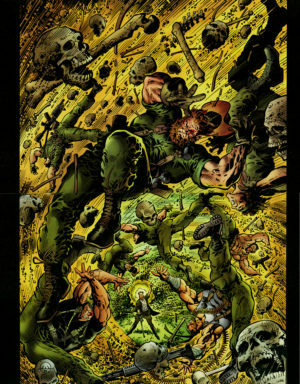 All of the material aside from the prologue is collected in a single TPB (Amazon / eBay). [Patreon-Nov16-Post-Bug][/Patreon-Nov16-Post-Bug]This month of reading WildStorm from the beginning has frequently defied my expectations, with my enjoyment of the contents nearly reversed from what I expected. Team 7: Objective hell tops that list of unexpected outcomes. It’s a riveting, gorgeous, well-written book that merges military themes with superhero powers. There are a few tiny nods to the future of these characters, particularly for Slayton/Backlash, but otherwise this series hardly acknowledges the wider WildStorm Universe and the future it holds in store. Chuck Dixon shines here even more than on the original limited series. Past needing to introduce his massive cast and take them through multiple missions, this series has both more action and better character moments. No one gets the sort of monologue or grandstanding they did in the first series. It’s all tiny beats that tell us more about the team – particularly Slayton’s temper and the babyfaced Cash’s rise to leadership before an eventual fall from their graces. Every page of this book looks damned great. The covers truly don’t do justice to the interior pages. Chris Warner spares no detail in illustrating the jungle environs of Nicaragua and Cambodia. A gang of multiple inkers introduce some variation but fill every page with plenty of contrast for colorist Monica Bennett to make pop with rich greens, golden flesh tones, and Team 7’s red war paint. 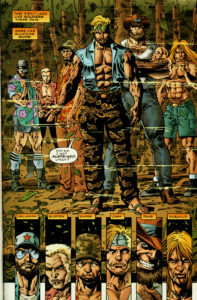 The long-haired, well-muscled men of Team 7 have a certain mercurial hint of motion that’s reminiscent of issue #1’s cover artist, the legendary Barry Windsor Smith. The members who we don’t know in the present day stand out the most, with Caitlin Fairchild’s father clearly modeled on Iggy Pop and Grunge’s father Chang drawn more distinctly as an Asian than on the prior outing. The inspiration for this story seems near to that of The Divine, an OGN I reviewed last year. The difference is that while The Divine was about child soldiers in an eternal war, O bjective Hell is about a small bubble of peace that Team 7 is forced to disrupt for the greater good. Was a greater good achieved? There’s no question that removing low-yield nukes from the grasping Khmer Rouge is a positive, but the open psychic warfare between US and Russian forces signaled a new front of the Cold War that Team 7 found themselves alone to defend. While they escape with only one serious casualty this time, it helps to frame their later choice to splinter and become mercenaries. As long as the specter of their reassembling as a team exists in the world, the US Government will find some threat that demands their intervention … but does their existence also escalate the seriousness of the threats? Team 7: Objective Hell doesn’t hold those answers or very many keys to the big questions we’ve been asking about Backlash, Grifter, Dane, Lynch, and Cray, but it is a superior WildStorm offering that makes me wish we had an ongoing comic to add more past missions to Team 7’s published history. Want a recap? Keep reading for a summary of how these soldiers became super. Here’s the schedule for the rest of this month’s WildStorm re-read. Tomorrow is the main event! WildStorm Rising! Let’s get ready to cross over, baby!